Bette Midler (born December 1, 1945) is an American singer, actress and comedienne, also known (by her informal stage name) as The Divine Miss M. During her career, she has been nominated for two Academy Awards; and won four Grammy Awards, four Golden Globes, three Emmy Awards, and a special Tony Award.In 1945, Midler was born in Honolulu, Hawaii. She is the daughter of seamstress/housewife Ruth (née Schindel) and house painter Fred Midler, who worked at a Navy base in Hawaii. 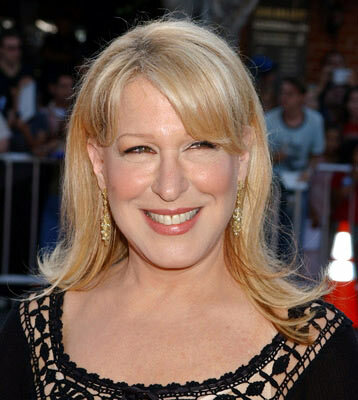 Her parents were from Paterson, New Jersey and moved to Honolulu before Midler was born. She was named after the actress Bette Davis, though Davis pronounced her first name in two syllables, and Midler uses one. Midler's family was one of the few Jewish families in a mostly Asian neighborhood. She was raised in nearby Aiea and attended Radford High School in Honolulu. She was voted in Hoss Election 1961 "Most Talkative" and in her Senior Year (Class of 1963) "Most Dramatic" . She majored in drama at the University of Hawaii (though she only attended for three semesters) and earned money in the film Hawaii (released in 1966) as an extra, playing a seasick passenger named Mrs David Buff in the film.